We recommend highly talented professionals on an international scale to contribute to the success of your global sales strategy. External Recruitment: through a proactive search of multilingual sales professionals who match our client's selection criteria. Our evaluation methods take into account not only sales and managerial skills but also candidates´ cross-cultural capacities. Only the best and most qualified candidates are introduced to our clients. Internal Recruitment: by helping our clients determine the best suited employees for overseas position, according to the job’s requirements and country of expatriation. After having identified and evaluated all potential internal candidates, we share our recommendations for the position to fill. We provide targeted research using either direct sourcing “Headhunting” or a mixed approach, depending on our client’s selection criteria and the degree of confidentiality required in the recruitment process. Beyond our proactive approach we are involved in innovation, and therefore integrate e-Recruitment Strategy into our hiring process using social networks (Linked in, Viadeo, Facebook, Twitter etc. ), the Internet online communities and blogs. 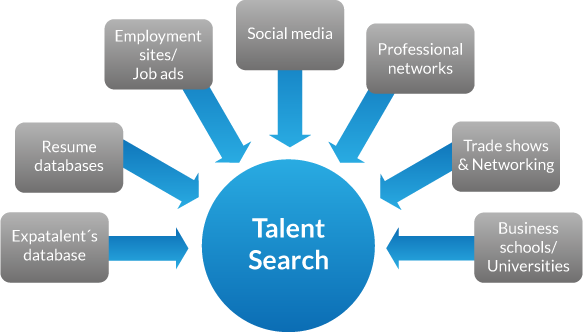 We search and select top sales talent among a large number of international candidates. Thereby, we offer a multilingual evaluation of candidates in English, French or Spanish corresponding to the job vacancy requirements. Our transparency, dynamism, spirit of innovation, and tailored approach attract the best available sales professionals on the market.